Inn at Valley Farms (Walpole, NH) When the Caserta family purchased their 105-acre organic farm in 1998, they knew they were buying a piece of Americana: a dairy farm with lots of “character.” Also, one that was in need of work. There were numerous large buildings on the property, including a massive dairy barn. But, all were in disrepair. In order to generate income and keep the property together, after extensive renovation, they decided to open the main house and two cottages to guests as a B&B. That was in 1999. Today, the Inn at Valley Farms offers three types of lodging options: private inn rooms, cottages and a vacation farmhouse. 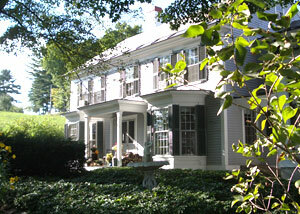 Inn rooms are located in their gracious 1774 Colonial home. All have private baths, with lots of common space throughout the inn to relax in. Guests of the inn are also pampered with a decadent three-course candlelight breakfast, a bottomless jar of homemade cookies available 24/7 in their butler's pantry, and Burdick Chocolates at bedside. The Inn's breakfast menu always centers around what's fresh and local, so it changes regularly with the amazing bounty found on or around their farm - all made with their own pastured organic eggs and as much of their farm's organic produce, herbs and edible flowers as possible. Cottages are set up as a “home away from home,” and very family friendly. Each cottage features its own kitchen, three bedrooms, satellite TV, and private entrance. Cottages are a great option for families looking for a base for a longer stay to explore the area. The kitchens give them great flexibility. 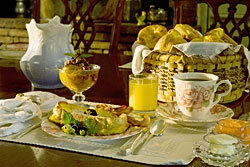 Cottage guests are treated to a homemade continental breakfast each morning. The kitchen is stocked with breakfast basics upon arrival, and a basket of homemade baked goods, locally made breads and their own fresh organic eggs are brought to the doorstep each morning. Inn at Valley Farm’s farmhouse is a self-sufficient unit, capable of sleeping up to 8 people. It comes complete with everything needed for an extended stay, including a dishwasher, washer/dryer, and farmer's porch and rocking chairs. A fire pit is also available as a gathering place for special bonding time. 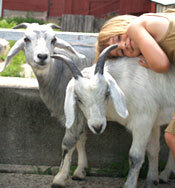 The Inn at Valley Farms uses no chemical fertilizers or sprays on their working farm. Instead, they use crop and animal rotation and focus on building healthy soils. Guests are welcome to sample fresh produce from the gardens in season and pick their own bouquet of flowers. Inn fact, Inn at Valley Farms has their “environmental philosophy” posted right on their web site. There is a plenty of safe play areas including a sandbox, swing set/jungle gym and lots of open space for exploring. Guests can visit the farm’s chickens, cows, pigs, cashmere goats, barn cats; collect their own fresh eggs, and “help” with the chores. In addition, there is a hiking trail through their woodlands for guests to explore or walk to a neighboring orchard and pick more than 100 varieties of fruit in season. Also just a short distance to downtown Walpole, said to be one of the most picturesque villages in all of New England, you’ll find fine dining, several unique shops, a great 9-hole golf course and golf, and free summer band concerts on the common. 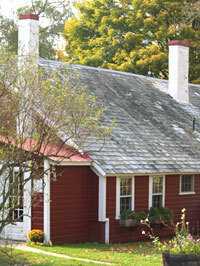 The Inn at Valley Farms can sleep up to 28 guests when completely occupied. With something for everyone, they provide a great setting for family gatherings, special occasions, intimate weddings, and business retreats. Annual Outdoor Movie Night: free and open to all. Enjoy classic cartoons and a feature movie shown on the side of their century old barn, complete with unlimited popcorn and pot luck desserts. Family Farm Day: Celebrate local food with farm & garden tours, demonstrations, live music, their own 100% grass fed burgers for sale, children's activities and more. Check the events calendar on their web site for dates and specific details for these events and others.